It has definitely been a bummer of a winter. It all started with the Christmas snowfall which turned into rain and left a mess on the ground. It buried most of the dried flowers under snow and ice making it difficult to photograph them. It also wrecked my ski trails. 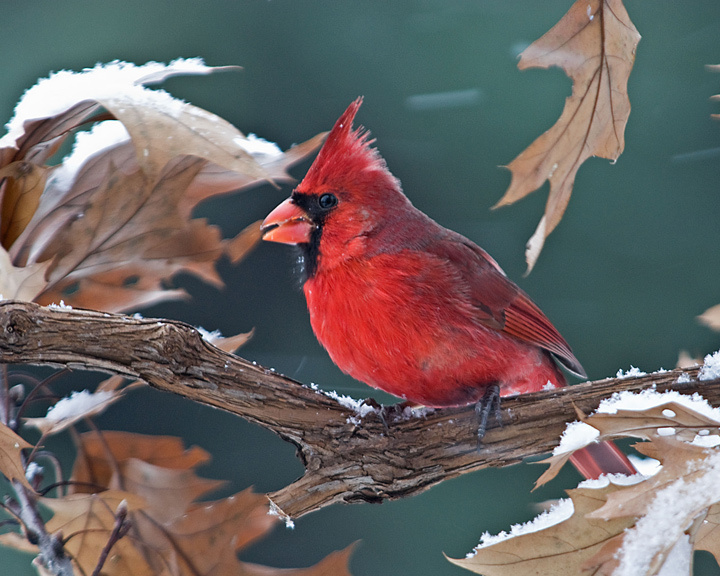 One of my favorite winter photography subjects are birds during a snowfall. Unfortunately most of the early snowfalls were more rain than snow. When it did snow it was usually at night when I couldn’t do photography. In addition, I’ve had a hawk hanging around which caused the Northern Cardinals to show up early in the morning and late in the afternoon when the light levels were low. I also didn’t have much in a variety of birds this year. 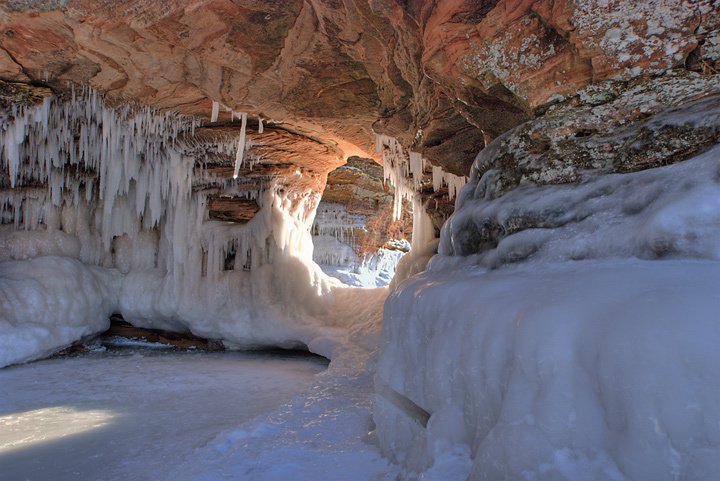 My favorite winter photography subject is the Apostle Islands Ice Caves. Unfortunately they didn’t open this year for the first time in a number of years. It looked like they were close to opening in mid February when the ice pack was just about frozen solid. A strong wind came up and the ice pack broke up and was pushed out into the lake. As a result there was no access to the Ice Caves This year. About this time we were scheduled to head to the UP of Michigan and the Minnesota North Shore for some cross country skiing and photography when my wife fell on a gentle ski slope and tore up her MCL. That ended any travel for the rest of the winter and probably well into the spring. 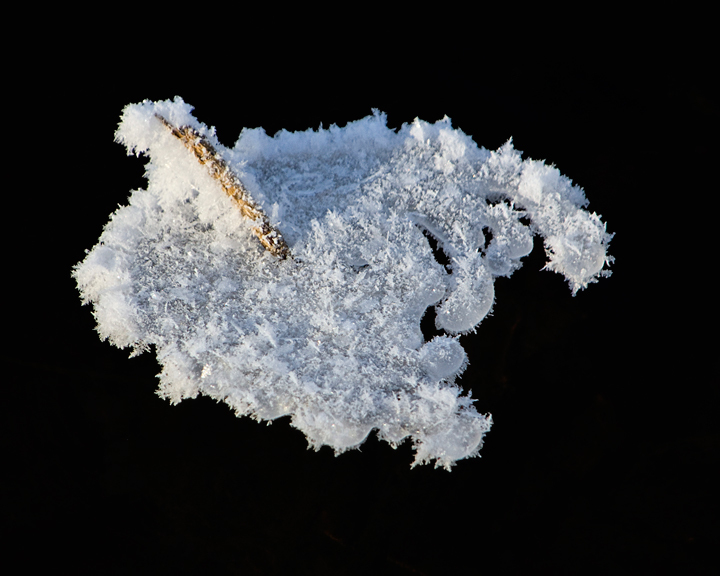 On the positive side it’s been a great year for photographing hoary frost. 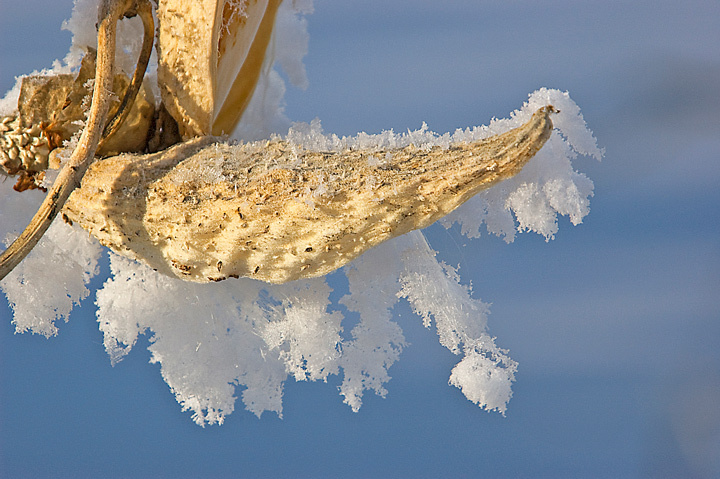 It started in the fall when I encountered heavy frost on the plains east of town and at Hoffman Hills Recreation area. As the winter advanced I continued to find frost along the Red Cedar State Trail usually on very cold mornings. I also found frost during several trips to Willow River State Park. The Apostle Islands Ice Caves, also known as the Apostle Islands Sea Caves and the Mawikwe Sea Caves, are part of the Apostle Islands National Lakeshore and are one of the most stunning winter photography locations in the Upper Midwest. 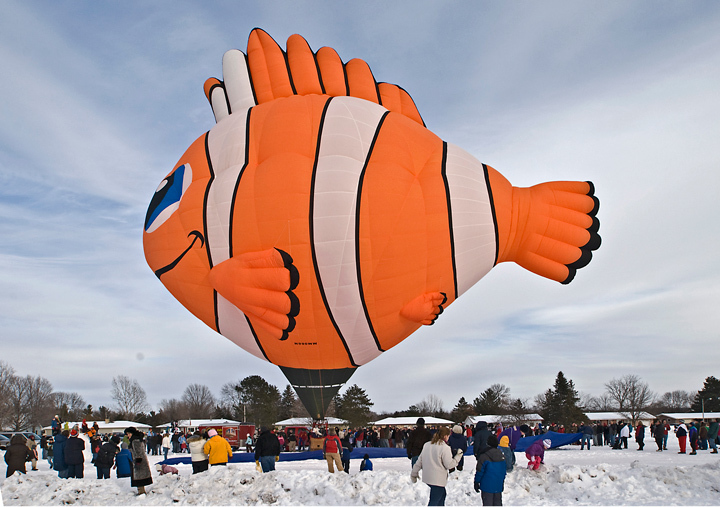 They are visited by thousands of people every winter. This is my most popular winter destination and a place I visit every year that the caves are open. 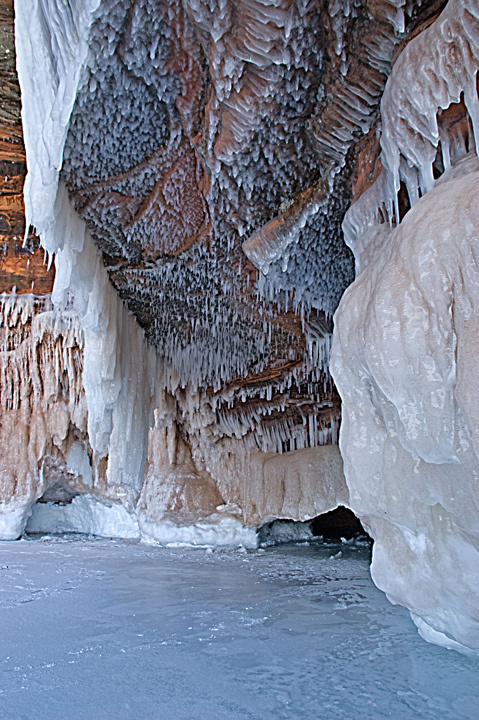 Access to the caves is dependent upon Lake Superior freezing over in the winter. It doesn’t always happen but if the lake does freeze and permits lake access to the caves it usually happens sometime in February. 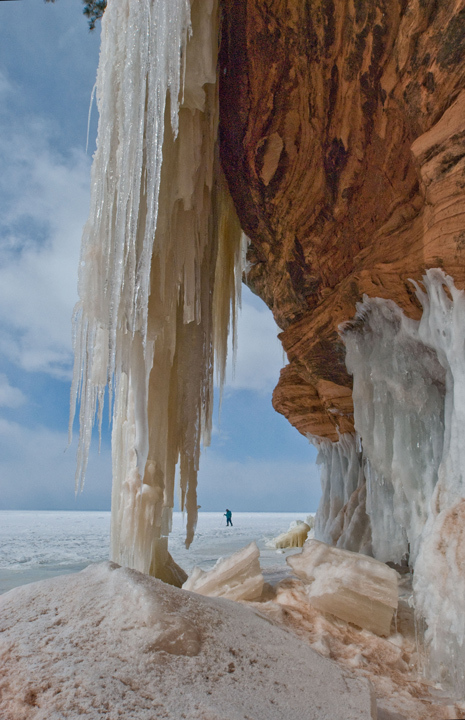 The Apostle Islands National Lakeshore maintains a hotline you can call for ice conditions. I typically start call around the first of February. The caves are accessed from Myers beach near Cornucopia, Wisconsin in Bayfield County. There is a parking fee at the Apostle Islands National Lakeshore parking lot at Meyers. Once there simply walk out onto the ice turn right to follow the shoreline east for about a mile where you will find the beginning of the caves. You can walk along the shore for several miles viewing the various ice formations. The ice formations are the result of waves splashing against the shore and water seepage through sandstone rocks. The result are large ice walls, ice waterfalls, large chunks of ice hanging from vines, flowing ice and within the caves stalactites hanging from the ceiling. If the ice is not safe to walk on you can walk along the trail above the lake to reach viewpoints for the caves. The walk out is also interesting with a number of small streams flowing into Lake Superior creating patterns in the sand. Be sure to dress warmly for your trip. 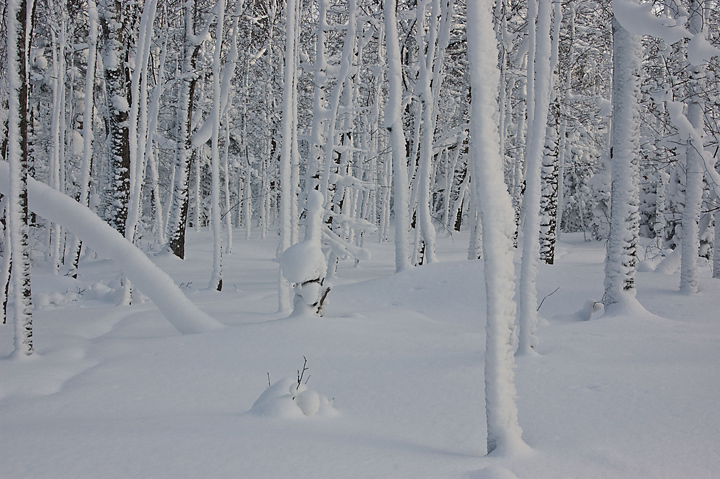 See my blog posting on winter photography tips for information on clothing and accessories. I usually try to visit the caves during the week to avoid the large crowds. The caves face north so they are in the shade most of the day. However, late in the afternoon the sun reaches the caves and brings out the color in the rock and creates some great shooting conditions. 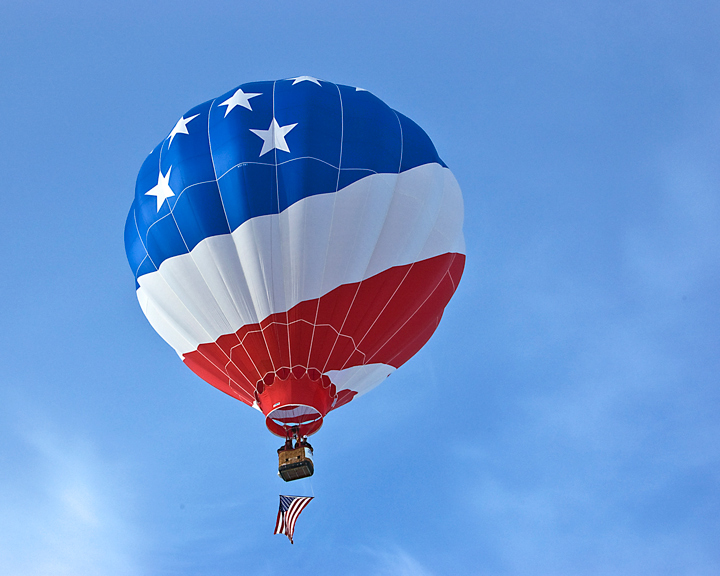 You may also find some difficulty shooting in the extreme light conditions. 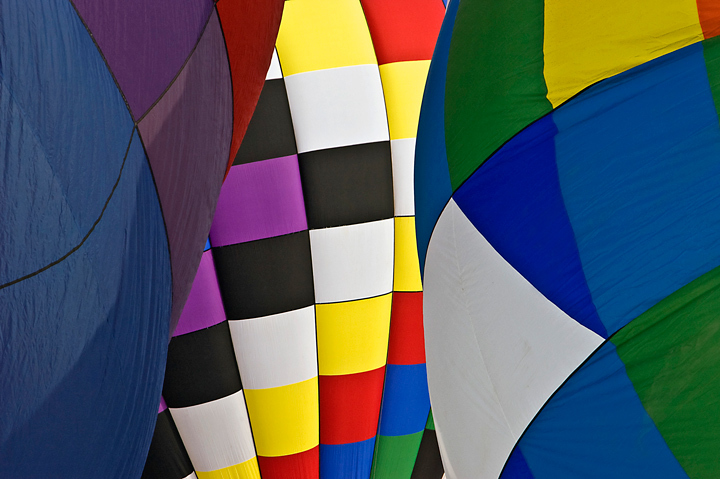 You may want to consider shooting multiple shots of the same scene to capture the entire dynamic range. I normally use an 18-200mm lens for general shots outside the caves and an 11-18mm lens for shots in the caves. Shots within the caves are usually in a confined area. Additional ice cave photos can be found at my website. My favorite waterfall for winter photography is Willow falls located in Willow River State Park near Hudson, Wisconsin. 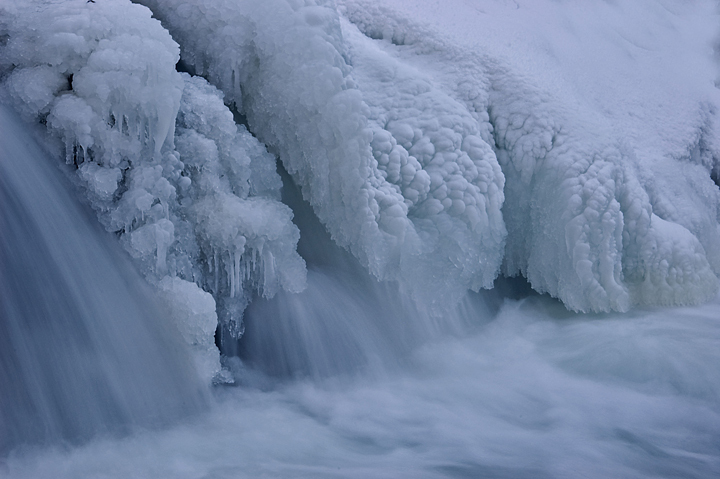 What I like about Willow falls is the fact that during most of the winter the falls is not entirely frozen so you have the opportunity to photograph ice formations in combination with running water. I generally start photographing toward the end of December. 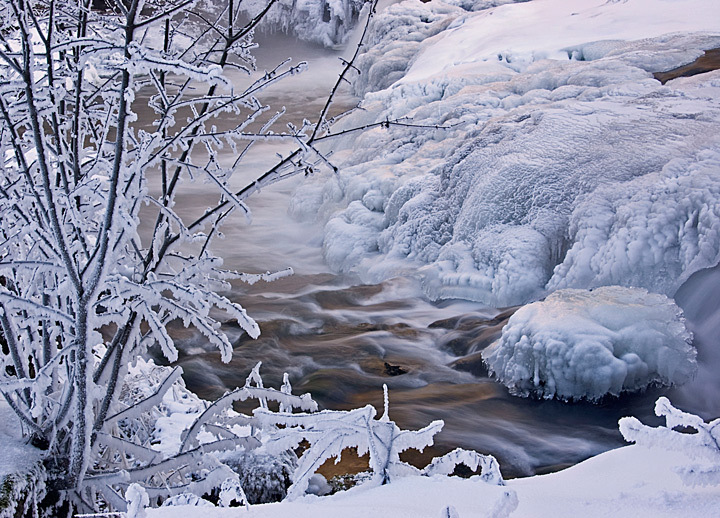 If we get a cold snap and some fresh snow it signals that it is time to head to Willow falls. 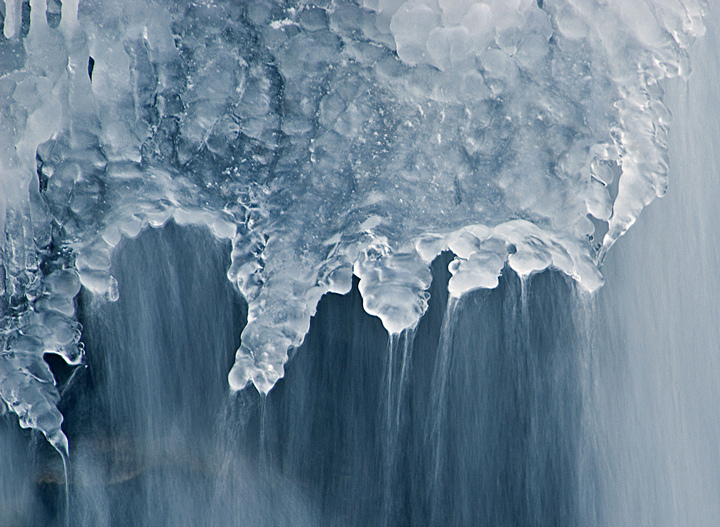 I typically use a 28-300mm lens which allows me to take in the full falls as well as shoot close-ups of ice formations. Occasionally I use a wide angle lens. 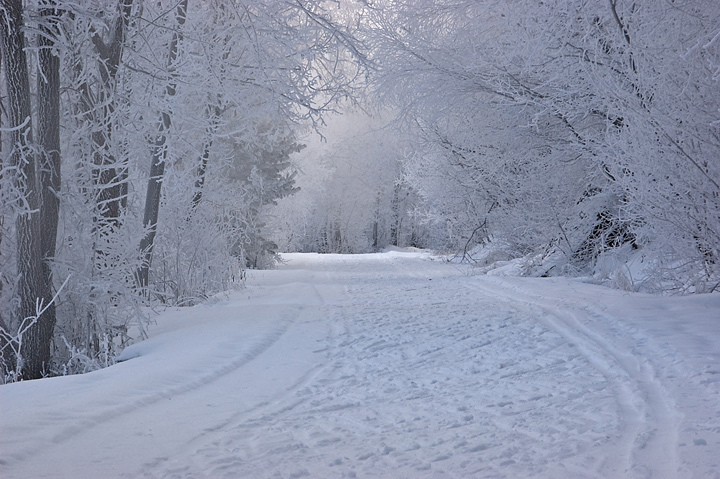 If we have a real cold snap and there is a lot of open water you can encounter considerable frost buildup on the trees and ground cover surrounding the falls. I spend most of my time shooting individual ice formations usually in combination with open water. This is the site of my greatest photographic disaster. It was my first winter photographing at willow falls and I became so excited at seeing the great ice formations that I accidentally turned the wrong knob on my tripod head and loosened the camera from the tripod. When I picked up the tripod to move it the camera fell into the water. The camera seemed to fall in slow motion as I watched. Access to the falls is somewhat limited in the winter because most of the trails are groomed for cross country skiing. If you drive to the park on county road A and drive past the park entrance you will see a parking lot on your left. Note that a fee is required for parking. You can walk on the ski trail down to the falls from this parking lot. This is also a cross country ski trail so walk with care and don’t walk on the ski tracks. The walk down into the river valley is steep and can be treacherous if it is icy out. I always wear STABILicers traction devices on the bottom of my boots. They have steel cleats that provide excellent traction even on steep icy slopes and Velcro straps that make them easy to put on and remove. There are a variety of such devices on the market that work well on ice and hard packed snow. These are also helpful in walking around the falls. Additional photos of Willow Falls can be found on my Website.